In applications such as signal processing and statistics, many problems involve finding sparse solutions to under-determined linear systems of equations. These problems can be formulated as a structured nonsmooth optimization problems, i.e., the problem of minimizing ℓ 1-regularized linear least squares problems. In this paper, we propose a block coordinate gradient descent method (abbreviated as CGD) to solve the more general ℓ 1-regularized convex minimization problems, i.e., the problem of minimizing an ℓ 1-regularized convex smooth function. We establish a Q-linear convergence rate for our method when the coordinate block is chosen by a Gauss-Southwell-type rule to ensure sufficient descent. 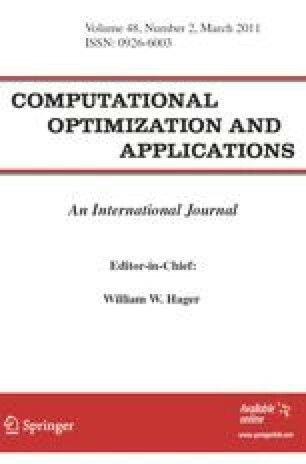 We propose efficient implementations of the CGD method and report numerical results for solving large-scale ℓ 1-regularized linear least squares problems arising in compressed sensing and image deconvolution as well as large-scale ℓ 1-regularized logistic regression problems for feature selection in data classification. Comparison with several state-of-the-art algorithms specifically designed for solving large-scale ℓ 1-regularized linear least squares or logistic regression problems suggests that an efficiently implemented CGD method may outperform these algorithms despite the fact that the CGD method is not specifically designed just to solve these special classes of problems. Research of K.-C. Toh was supported in part by NUS Academic Research Grant R146-000-076-112.